Lord Sackville is a celebrated publisher and author and the head of Knole House, a stunning National Trust country house in Sevenoaks, Kent—if you can really call an estate with 365 rooms, 52 staircases, 12 entrances and 7 courtyards a ‘house’! Lord Sackville first lectured for Royal Oak in 2010 and we are thrilled to welcome him back to tell the scandalous tale of the illegitimate Sackvilles, based on his latest book The Disinherited: A Story of Family, Love and Betrayal. 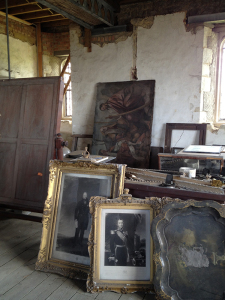 Portraits in Knole’s attic can transport you back to another era. 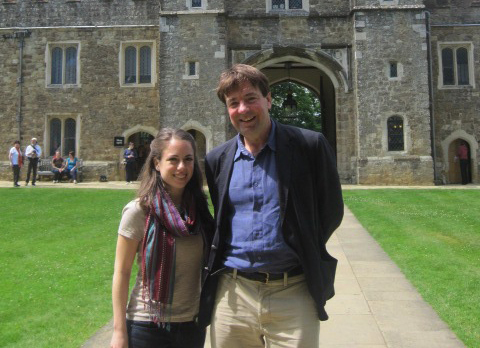 As the snow continues to fall on the east coast, I can’t help but dream of warmer days and reminisce about my own visit to Knole in the summer of 2012. I remember the sense of awe I felt coming up the approach, the deer grazing mere yards away from me as I gazed upon Knole for the first time. It was a privilege to explore this place with such rich history, knowing that 13 generations of Sackvilles walked these same halls and looked upon with pride the Sackville panthers that dot the façade. But what struck me the most were the remote corners of Knole that took me back in time—the attic where dust-covered old portraits and mirrors lean against one another; the armoire opened to reveal a World War I uniform; the rickety ladder to the roof offering a bird’s eye view of this vast estate. 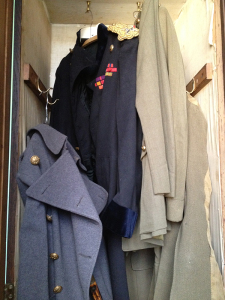 An old WWI jacket, tucked into a Knole closet. So as a I pull on my wellies and bundle up for the cold, I will remember strolling through the grounds of Knole with Lord Sackville, his chocolate lab bounding through the gardens, feeling as if I had been thrust into a Jane Austen novel where at any moment we might happen upon Mr. Darcy.